The Reason Why is the CCF’s regular event to give the opportunity to donors and supporters to visit projects where our grants have made a difference to the community. The Camborne event on the 5th of May, attended by 30 supporters of the CCF, first visited Transformation CPR and then continued with a presentation by the Camborne and Redruth Live at Home Scheme at Tregullow, kindly hosted by James and Sarah Williams. Camborne, Pool and Redruth, the largest urban area in Cornwall, is one of the most deprived areas of Cornwall. Transformation CPR runs CPR Foodbanks and CPR Street Pastors to address needs in Camborne, Pool & Redruth. Donovan Gardner gave a hugely inspirational presentation about the great work of Transformation CPR. CPR Foodbank provides emergency food to 500 people every month. Many of these people come to CPR with more complex needs. An average of 22 people per month cites debt issues as their reason for accessing the CPR Foodbank – low income, seasonal work and low levels of savings are just some of the factors that drive many people towards taking on debt. Transformation CPR received £4,000 from the CCF in November 2015 towards the salary of a Debt & Benefits Advice Coordinator. The CCF has invested £13,066 in Transformation CPR projects in the last 3 years. Camborne and Redruth Live at Home Scheme offers services and support to help older people lead independent, active and fulfilled lives, and to live securely. Diane Bruford Live at Home Manager talked about their services and plans for the future. The scheme has four friendship groups which have been in existence for some years. The group at Illogan began in May 2002, their Redruth group in November 2008 and Camborne in August 2010. They have an average of 50 members who attend each week. As well as the normal weekly meeting they also go on an outing and a Sunday lunch on a monthly basis. Diane Bruford said “The scheme is always in need of more volunteers and is able to welcome more members. We are now looking forward to expanding the scheme now that we are operating in Helston and shortly in Hayle.” The CCF has invested £20,448 in Camborne and Redruth Live at Home Scheme in the last 10 years. 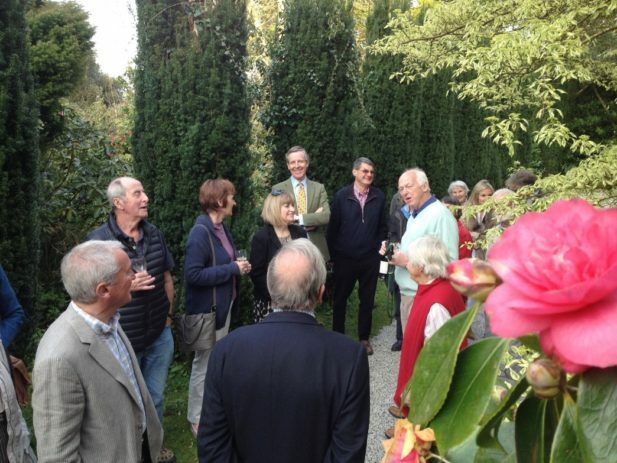 The event concluded with a private garden tour at Tregullow kindly hosted by James and Sarah Williams. The fantastic garden was at its best and CCF Trustee James Williams gave an insight into the clearing and replanting project.